Demand for meat across the world has caused a sharp increase in farmers’ use of antibiotics, with China and the United States at the top of the list. The use of antimicrobial drugs is projected to rise drastically by 2030. Pig farmers use four times as many drugs as cattle ranchers, with poultry farms falling somewhere in between, says a study published in Proceedings of the National Academy of Sciences last week. 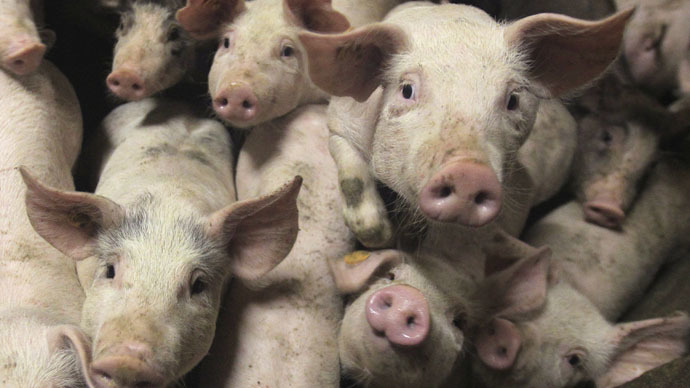 China, the world’s largest pork producer, is also the world’s biggest consumer of antibiotics in farming. The US comes in second, consuming 10 percent, while Brazil, India and Germany round off the top five. The study says that farmers around the world used over 63,000 tons of antibiotics to raise livestock in 2010 and projected the number will rise to over 105,000 tons by 2030. Antimicrobials are used to boost and accelerate growth in animals, as well as keep them healthy while penned up in barely sanitary industrial farms. “We've found that when animals have good nutrition, good genetics and there is good hygiene on the farm, the added value of antibiotics is quite minimal,” said Ramanan Laxminarayan, director of the Center for Disease Dynamics Economics & Policy in Washington DC. While cattle take a while to build up herds, poultry and pigs can be raised quickly and in confined spaces, explained Timothy Robinson, principal scientist at the International Livestock Research Institute and one of the authors of the study. In most of the world, researchers say, there are few if any laws regulating the use of antibiotics in farming. The European Union has strict laws against growth-boosting drugs, but allows farmers to treat animals to prevent disease. In the US, farming accounts for 80 percent of all antibiotics used. The Food and Drug Administration has urged a halt to using human antibiotics on livestock since 2013, following a Centers for Disease Control and Prevention report showing that at least 23,000 Americans die every year from antibiotic-resistant bacterial infections. “Antimicrobial resistance is a tragedy of the commons, but with more direct individual effect than climate change,” said the study’s lead author, Princeton University ecologist Thomas Van Boeckel. Several major US restaurant chains have sworn off antibiotic-treated meat. Chipotle has suspended the sale of pork at many of its locations since January, after its supplier was unable to meet demand using only humanely-raised pigs. Pharmaceutical companies and corporate farms have challenged claims that the use of antibiotics in animals is related to the rise of resistant bacteria. While direct evidence remains elusive, “circumstantial evidence, linking use in animals to drug-resistant bacteria in humans, is exceedingly strong,” said Laxminarayan. He added that resistant bacteria usually reach humans through the water supply and other means, rather than through the direct consumption of animals raised on antibiotics.